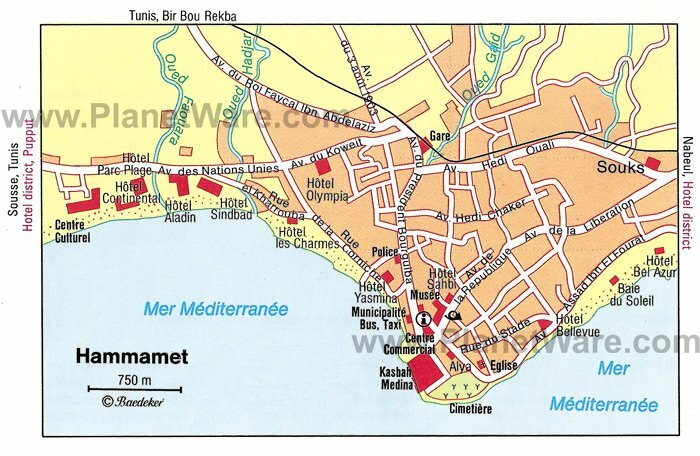 Hammamet has a wonderfully quaint location, snugly wrapping around a cove on the Cap Bon Peninsula. This is Tunisia's original tourism resort. Its sandy beaches and pretty, well-preserved medina (old town) are the main points of interest, and the town itself is a gentle introduction to the culture and traditions of North Africa. Sightseeing here usually comes second to lazing about and soaking up the endless sunny weather, but if you find yourself itching to get off the beach, Hammamet is perfectly placed as a base to explore the rest of Cap Bon's tourist attractions. Surrounded by its original 15th-century walls, Hammamet's maze of narrow and winding lanes within the town's medina (old town) hosts a wealth of well-preserved traditional Tunisian architecture. Some of the alleyways have been covered, so even in the heat of summer, the medina remains cool and shady - making an exploration here a pleasant respite from the harsh sun. There are plenty of shopping opportunities, with local embroidery, ceramics, leather goods, and carpets all on display, though wares tend to be on the pricey side within the medina shops. In Hammamet's southern hotel zone (beyond the Hotel Continental), the Cultural Center is housed in the sumptuous Villa Sebastian. George Sebastian, a wealthy Romanian who was the first of many wealthy Europeans to settle in Hammamet during the early 20th century, built the structure in the 1920s. The beautiful villa gardens host the Hammamet International Festival of Music and Drama every July and August, Hammamet's biggest annual event. If you're in town at this time, don't miss it. If you've come to see the villa and have an interest in history, head further along the coast (between the Samira Club and Tanfous Hotel) to find the excavation site of the Roman settlement of Pupput. The ruins of the site (Hammamet's first settlement) are sparse, so are probably only of interest to the most enthusiastic history buff. The medina is full of gorgeously restored examples of traditional Tunisian architecture, but two of the most important buildings in the district are the Great Mosque and the Sidi Abdel Kader Mosque, which adjoin each other. The Great Mosque was built in the 15th century and restored in 1972. Its rectangular minaret is a particularly fine example of Islamic architecture. The Sidi Abdel Kader Mosque was built in 1798 and now functions as a madrassa (Islamic school). Non-Muslims cannot enter either building, but it is worthwhile passing by to admire the facades. The 13th-century Kasbah of Hammamet isn't as well preserved or impressive as the Kasbah of Sousse, but it is still worth visiting, particularly if you're looking for a side of history to complement your beach time. There is an interesting museum inside that explains Hammamet's colorful pirate lair history and later Spanish occupation. While here, don't miss climbing up to the top of the ramparts for magnificent views across the medina and picturesque fishing harbor. It's a great place to come for sunset photos of the Mediterranean. 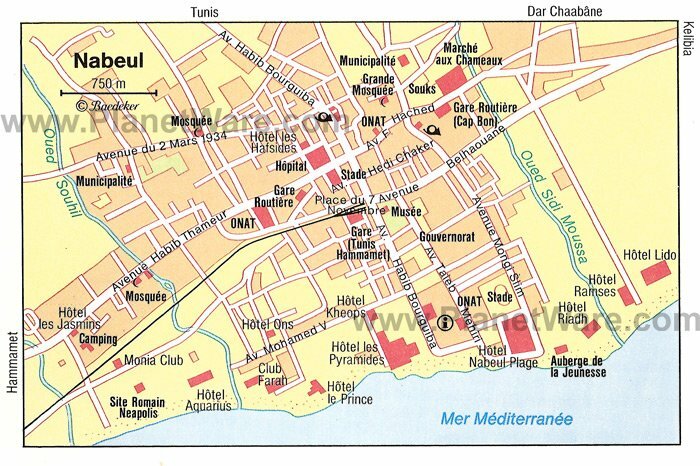 Nabeul is the Cap Bon Peninsula's largest town, edged by a long sandy beach extending around the Gulf of Hammamet. Surrounded by intensively cultivated agricultural land, the town's Friday Market is a bustle of fresh produce and local action that photographers will love. It's also a craft-making center, and shoppers can pick up lovely locally-made pottery and plaited mats. Textiles are available here at cheaper prices than in Hammamet. Visiting the Archaeological Museum (Avenue Habib Bourguiba) is another one of the popular things to do here. It is an excellent introduction to the history of Cap Bon, with exhibits of Punic and Roman finds from local excavation sites (although the best of the finds are displayed in the Bardo Museum in Tunis). Only discovered in 1952, the site of Kerkouane is thought to have been settled by the Phoenicians from the 6th century BC, long before Carthage was founded. A village of fishermen and dyers, it was razed to the ground by the Romans during the Third Punic War and never rebuilt, so the original layout of the Punic town has been preserved intact. The town was laid out in the shape of a horseshoe and enclosed by a double ring of walls with two gates. Excavations have revealed mainly the network of streets and the foundations of buildings, with marble-floored houses that boast red and white mosaic decoration (much of which has been preserved). In many houses, the rooms were laid out around a central courtyard with a fountain. Particularly notable is that almost every house had its own bathroom. There are also drainage channels, which show that the town had a highly developed drainage system. Also of interest are the remains of a dye factory, with tubs hewed from the rock in which the shellfish (murex) used to make the purple dye were collected. The Phoenicians had a monopoly on the production of murex dye, which was the most prized dye of ancient times (almost 5,000 shellfish being required to produce a gram of dye). A small museum beside the excavation site illustrates the history of Kerkouane and the archaeological work that has been carried out since 1966. At the northern tip of Cap Bon is the fishing village of El Haouaria, which is famous for its falcon spotting opportunities during spring, when the birds descend here as part of their migration to Europe. The village has a long tradition of training falcons to hunt quail. If you visit in May try to catch their Falconry Festival, when you can witness the skills of the village falconers in action. A few kilometers northeast are El Haouaria's Roman Caves, formed by quarrying of the sandstone coastal cliffs, first by the Carthaginians and later by the Romans. Shafts of up to 30 meters long can be seen. One of the best day trips from Hammamet for history fans is to the small town of Kelibia, which is crowned by a fortress on a 150-meter crag looming over the town. Originally built by the Byzantines, it was enlarged and strengthened under the Hafsid dynasty. The thick fortress walls have been excellently preserved, and if you climb up into the bastions, you'll be rewarded with magnificent views across the Mediterranean. On a clear day, you can pick out the form of Sicily in the far distance. The hot springs of Korbous have been frequented since Roman times, when the area was known as Aquae Calidae Carpitanae. Ahmed Bey rediscovered the springs in 1801 and established a spa complex here. Rich in minerals, the water is said to help the treatment of skin conditions such as eczema and also to help ease the pain of rheumatism and arthritis. There are more hot springs to check out just two kilometers north of Korbous. Hamma el Atrous springs have a wonderful setting, with pools cascading down into the sea and steaming temperatures of up to 50°C. This local market center is surrounded by agricultural land and has a picturesque old town district, where the architecture has a distinctively Andalusian feel to it. The 17th-century Malikite Mosque, roofed with semi-circular tiles, and the Hanafite Mosque, with its octagonal minaret, are two of the most interesting buildings to search out while threading through the medina alleys. If you're just after a lazy afternoon in the sun though, the Soliman Plage (beach) is a popular and pretty stretch of sand. About eight kilometers north of Soliman, the MC128 highway runs along the cliff-fringed coast of Djebel Bou Korbous, known as the Côte du Soleil (Sunshine Coast). This 12-kilometer stretch is one of the most beautiful roads in Tunisia. On the right, steep hills rise up to 419 meters, while on the left side, sheer cliffs tumble directly down to the sea. There are various viewpoints along the road, where you can pull over and soak up views extending as far west as Carthage.